Why a hybrid solution is required, and what that means for future chips. 5G networks will impact the number and types of ICs in end-user devices and the base stations used to transmit the signals (including the repeaters that rebroadcast those signals). And this is before we begin to consider the technology impact to the infrastructure required to support the data generated in a 5G ecosystem (servers, memory and so on). 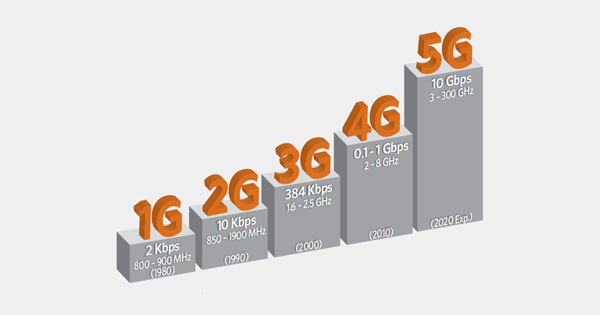 First, 5G is expected to transmit up to 10 times the data rate compared to today’s 4G technology. Additionally, 5G will have a greater number of multiple input (MI) streams/channels as well as multiple output (MO) streams compared to what is achievable today. However, because it is a higher frequency signal, it will only be able to transmit to a distance of about 150-200m and it will face absorption issues. 5G is short range and not suitable as a complete 4G replacement. The final solution will be some combination of 4G and 5G. Fig. 1: Expected to be released in 2020/21, 5G will dramatically improve on existing 4G technologies but not without its fair share of trade-offs and technological challenges. Examining the pros and cons of this technology provides a better understanding of what types of chips would be added or removed from the existing setups. For example, on the base station side, imagine having more input and output signals to manage. More channels equals more power and the need for more power ICs. And then there’s the burden of low range, which means a power boost will be needed. And furthermore, to manage the various sources of absorption, beam-steering technologies will be required, which will need to be run at frequencies that can potentially be one to two orders of magnitude greater than those seen today. If we now look at the power issue at the base station, we would see a need for higher power levels, which will create heat and waste power. This can be managed by using envelope tracking technologies. These chips do exist today (introduced during the 4G rollout) and essentially are used in RF power amplifiers to track the signal and boost the power as required, rather than constantly supplying high power and creating excess heat. So, what’s different? With the speed increase of 5G these envelope tracking technologies shift from employing a Laterally Diffused Metal Oxide Semiconductor (LDMOS) and Gallium Arsenide (GaAs) based devices to Gallium Nitride (GaN) in order to manage the higher power required with 5G and to accommodate the higher switching speeds required. Just from a power management perspective, a greater number of devices and new technologies are needed to support base station capabilities. Next, consider the need to steer the signal. This also requires high-speed devices—additional devices beyond what is seen today. Due to the absorption of high-frequency 5G signals, the transmission beam needs to be electronically “steered” to minimize losses and optimize the system’s transmission efficiency. Then, due to the short range, it’s likely there will be repeaters similar to the wireless repeaters sometimes used today, in order to boost the signal and overcome distance and attenuation issues. These also increase chip count. Continuing with this scenario, two additional calculations are at play: filtering a larger number of higher frequency signals used in a 5G system and multiplying the number of filters in the end-user device by the number of regions where the device will operate. Based on the Bulk Acoustic Wave technologies used in today’s front-end RF filters, the ever higher frequencies combined with increased input and output channels will further motivate the transition from Aluminum Nitride (AlN) to Scandium-doped (ScAlN) films and then beyond into newer films such as Lithium Niobate, which can potentially offer electromechanical coupling efficiencies twice that of the latest ScAlN films under development today. The replacement of high-speed power devices, the improvement of RF filter devices and the addition of beam-steering technologies will not be limited to base stations alone. They will also apply to repeaters and, in part, to the multitude of end-user devices that exist today and that will be created with the availability of a 5G communications infrastructure. Mike serves as director of strategy and technical marketing for the 200mm Equipment Product Group at Applied Materials.